What's new for you this year? Oh good! We've crossed the familiar threshold and begun a new year. In the cycle of things, we get to let go, refresh and move on. 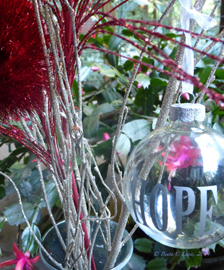 What will be new for you - and renew you - in 2014? We're co-creating a new era. Did 2013 feel like a transition year to you? If so, what are you transitioning from, and what are you moving towards? Do we consciously choose this? Or are we compelled by unconscious, deeply rooted patterns or by external forces and structures that pull us forward as though entranced? What are we waking up to at this time? In the somatic coaching discipline I practice, there’s an appreciation of DISorientation as a necessary prerequisite to REorientation. Think of putting in the clutch to change gears. Transition can feel like the gears are not engaging properly anymore. The new is emerging but has not yet clicked into place. That can feel disorienting, disruptive and disturbing. What to do? Get curious and touch gratitude. Be with what is…and choose again. This is the center from which any heart-centered "next" will flow. Consider another word for "curious." In German, the word for curious is neugierig. Neu means new; gierig translates to greedy or eager. Neugierig points towards an intense desire and openness for something new. 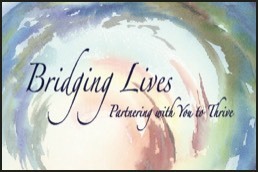 What are you REorienting towards? With respect (a willingness to look again) to that, what are you neugierig or curious about now? I'm curious about "B." Find out why below. What is my biggest challenge with setting up and sustaining trust-based collaboration? Please let me know by completing my brief survey. I’m curious about this from your perspective and experience. When you respond to my brief survey via this link, you’ll receive a gift from me with a trust-centered practice to try. 2) Join the conversation to explore what you can do to lead collaboration better. 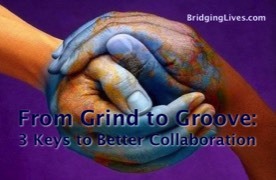 From Grind to Groove: 3 Keys to Better Collaboration. The first conversation will be on Thursday, January 30th. The transitions we acknowledge and claim now could open the way for real and needed transformation. The kind of transformation that brings you and those you lead more to life. Who will you be and what will you create by choice in 2014? Be in touch...and stay tuned! P.S. Please remember to provide input for my survey. Thanks! Do you have to abandon profit or sound business practice to provide material benefit to society and the environment? No. Indeed, you have new options for reorienting what works to become something better. Try this on. You're a business founder or executive. The point of offering what you do is to “make a difference” while also making a living. You are choosing mission-driven business with a conscience. How do you do that and not get swept up in the single-minded focus of optimizing profit or shareholder value? How do you embed your values into your organizational culture so they vibrantly take root and survive you as a legacy? How do you communicate and interact with your people - your co-creators, funders, employees, customers, larger community - so they support your being in business for the good? A new era is dawning in business. A little-known yet significant change is taking hold in the United States – and abroad – to provide legal structure for sustainable, for-profit enterprise. In response to the growing need for integrated solutions to systemic problems, legal and business leaders are creating anew. B is for Benefit. Leaders of business ventures large and small, start-up and long-standing can now (re)incorporate with an expanded purpose. Leaders for sustainable enterprise have the option of (re)structuring their organization as a Benefit Corporation or B-Corp.
...certified B Corporations are leading a global movement to redefine success in business and build a more inclusive, resilient, and sustainable economy. Success in the 21st century means achieving high growth and high impact. It means making money and a difference. 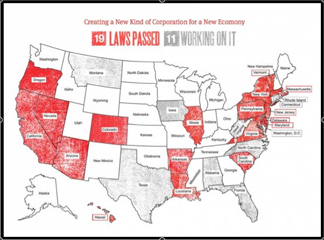 To date, at least 19 U.S. states have passed B-corp legislation. If you are incorporated in California, Nevada or Delaware, for example, you now have the B-corp option. Legislation details vary by state. Essentially, with B-corp status you voluntarily commit to fulfill standards of transparency about the fiscal, social and environmental impact of operating, growing and thriving as a company. Consider what this sets in motion. The triple bottom line – profit, people and planet – comes of age in the form of “benefit.” These new B-corp laws essentially provide legitimacy and structure for business with conscience. It could change what is possible for your bottom line, too. How could “benefit” position you as a leader in the marketplace, in your organizational culture and as a matter of legacy? You can lead for a better future. To state the nearly obvious, staying in business does suppose that we will be profitable, but that alone isn't really what it means to me to be sustainable. In the old model of business, success looks like a hot poker player who hits it big, sweeps up all his chips, cashes out, and goes home while he's on top. In our case, by contrast, the point is to keep playing, and, in the process, to create wins for all the players at once while the pool gets ever-bigger and ever-more rewarding for all involved. ...inevitably we'll fall short in any number of ways in our efforts to make this happen. But if we don't commit to making it a reality, it's safe to say that we're not even going to get close. What is your commitment to building your business for greater benefit? In 2014, I will be exploring questions about this with business leaders. Watch this space! And if you’re already on board about moving towards “benefit” and want support from the perspective of beneficial leadership practices and organizational culture, let's talk soon! Together, we can co-author a future for good - for benefit. Collaboration is “in.” It’s everywhere. It goes hand-in-glove with effective leadership. “Groovy” or not, it is tricky to keep high-performance collaboration going without getting bogged down in conflict or inertia. Yes, most partnerships and teams start off with good intentions and even good prospects for success. At some point, though, what began in an energetic upward spiral becomes a downward spiral of people and projects getting derailed. Commonly, people experience an oscillating pattern of things getting better and then getting worse. If that oscillation doesn’t take an overall upward trend, however, talented and well-intentioned people burn out. They disengage, become polarized and antagonistic. They stop listening or stop offering their best ideas or honest differences of opinion. Meetings become tedious, vaguely stressful and unproductive. Far too much energy is diverted by distraction, wasted time and energy, lack of focus, inefficiency, and loss of creativity and initiative. What happened? Is this just how it is and how it has to be? What a grind! All along, what you really want is to find your “groove”…together…and make great things happen. When business partnerships form and teams get together it’s meant to be fun and lucrative. You’re there to open new, exciting frontiers. Imagine how exhilarating it is to be in a partnership or on a team where people interact in ways that create and sustain an upward spiral of creativity! Where ideas are quickly and easily exchanged and continuously improved. You harvest the diversity of collaborative relationships as a source of higher intelligence and productivity. The whole becomes greater than the sum of the parts. Awesome! Ok, so what’s an essential missing link, core to the special recipe for collaboration that hums? … Trust. Yes. Trust. Difficulties with conflict management, miscommunication and dysfunction boil down to trust. 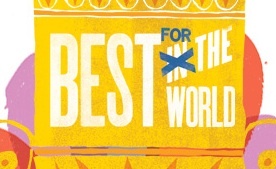 Trust with distinctions and actionable frameworks that work in business settings. This content-rich call is for leaders and business partners who know the value of high-performance collaboration and want more of it. I’ll share with you 3 familiar traps people commonly fall in that destabilize or derail collaboration. I’ll share 3 keys for what to do so you don’t stay caught in the trap or can avoid it altogether. Enroll now for the call. It's free. Lead. Collaborate. Grow. ... to Thrive!